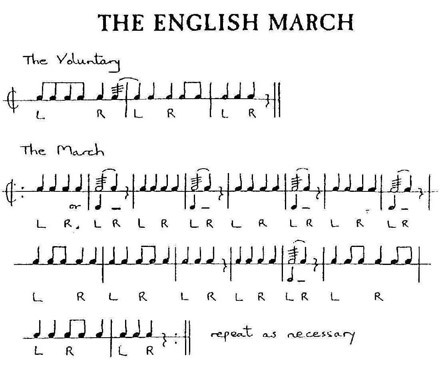 Master Drummer to the Royalist Army"
The English March is one of the few pieces of drum music which was most certainly used during the British Civil War (why is it so often called the English Civil War, when Scotland, Wales and even Ireland were involved?) and for which written music has survived. It was committed to paper at the command of Prince Henry in 1610 and this notion was incorporated in a Royal Warrant of 1632 'willing and commanding all drummers within our kingdom of England and principalities of Wales exactly and precisely to observe the same.....to the end that so ancient, famous and commendable a custom may be preserved as a pattern and precedent to all posteritie'. 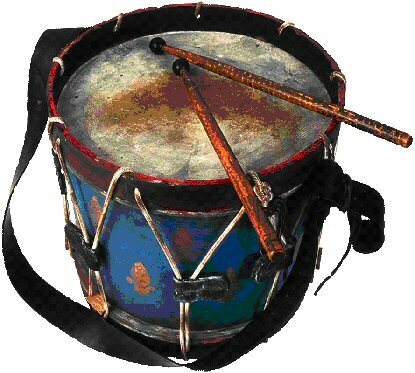 The warrant was apparently necessary because the march was 'through the negligence and carelessness of drummers and by long discontinuance so altered and changed from the ancient gravity and majesties’ thereof it was in danger utterly to have done lost and forgotten. 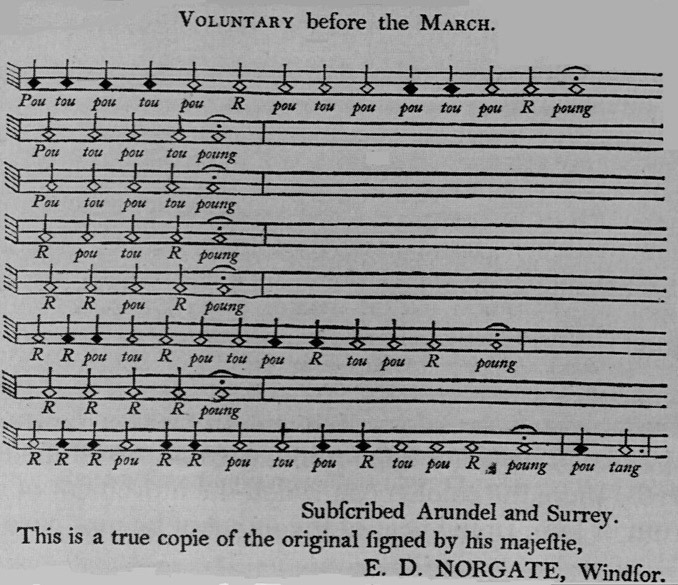 For a march to be described in such terms, it must have been something worth preserving, but the original score is somewhat strange to twentieth century eyes and cannot be said to convey the majestic quality so admired by our 17th Century forebears. 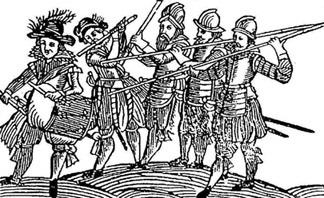 However, in 1971 it was deciphered by James Blades, the professor of Timpani and Percussion at the Royal Academy of Music, and I have further interpreted his version of it to make it suitable for Sealed Knot marching purposes. The main march is preceded by a 'voluntary' or introduction. This can be ignored, as it is by many Scaled Knot regiments, or it could be played by the Drum Major or leading drummer either as an introduction or as the order to march. Although the music contains some rolls, I have also shown alternative bars in which rolls are not used. The alternative is perfectly acceptable and both versions can be played quite happily together. To assist drummers in learning the beats, I have inserted beneath each bar the letter L and R, indicating where the left and right feet should touch the ground.